Judgment in the appeal by Geraldine Finucane to challenge the decision by Prime Minister David Cameron to hold a Review of papers in relation to the murder of her husband Pat Finucane will be delivered next Wednesday 27th February 2019 at 09.45AM at Courtroom 1, UK Supreme Court, London. The appellant was the wife of Patrick Finucane, a solicitor murdered in his home in North Belfast by an illegal paramilitary group on 12 February 1989. The State colluded in the murder by using its agents deliberately to manipulate loyalist paramilitaries so that they targeted suspected republican terrorists. The appellant’s husband, who was not connected with terrorism, was targeted in this way leading to his murder. The State knew of the plan to murder him and either took no action to prevent his death or was complicit in it. In July 2001, following a political agreement between the governments of the United Kingdom and Ireland (shared with the political parties in Northern Ireland), the two governments announced that an international judge would be appointed to undertake a review of six incidents which resulted in the deaths of 8 individuals,, including the murder of Patrick Finucane, in which there were allegations of collusion by the agents of the UK or Irish state. It was further announced that in the event the appointed judge recommended that a public inquiry be held in any of the cases, the relevant Government would implement that recommendation. Judge Cory was appointed to conduct the reviews in relation to all six cases. His reports were presented to the two governments in April 2004. He recommended that a public inquiry should be held in five of the six cases, including the murder of Patrick Finucane. 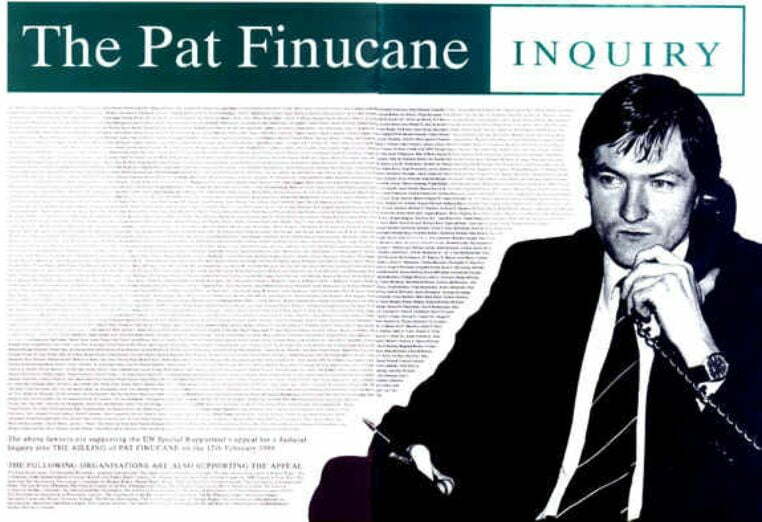 On 23 September 2004, the Secretary of State for Northern Ireland made a statement in the House of Commons announcing that a public inquiry would be established in relation to the murder of Patrick Finucane under new legislation which would shortly be introduced in Parliament. The Inquiries Act 2005 was later enacted and received Royal Assent on 7 April 2005. A new Government was elected in May 2010 and the Secretary of State announced a decision making process, by which it would be decided whether it was in the public interest to establish a public inquiry into the murder of Patrick Finucane. In October 2011, it was decided not to establish a public inquiry, but instead to appoint Sir Desmond de Silva to conduct an independent review into the circumstances of the murder. The appellant challenged this decision arguing that the decision-making process was a sham and had been pre-determined and that the commitment to establish a public inquiry had been unlawfully frustrated. She also argued that art.2 ECHR required a public inquiry to be held rather than the review established by the Government.